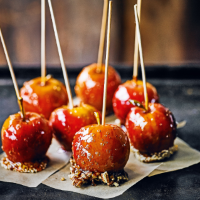 1 Push a lolly stick into the top of each apple and line a tray with non-stick baking parchment. Tip the sesame seeds and chopped nuts into separate bowls. 2 Place the sugar, golden syrup and 400ml cold water into a saucepan, heat to a simmer, stirring until the sugar has dissolved. Turn up the heat and boil until the mixture reaches 146°C, or hard crack stage. Remove from the heat. 3 Carefully dip the apples into the hot toffee and swirl to coat. If the pan is too shallow use a spoon to coat. Dip the bottoms of each into the sesame seeds or nuts. Place on the lined tray and leave until set.